The validity of a visa is three months. Travelers coming to Thailand with this type of visa will be permitted to stay in the Kingdom for a period not exceeding 30 days. ➜ Continue reading "Thailand visa part 2: Types of Visas"
➜ Continue reading "Thailand Visa part 1: Tourist Visas & Exemptions"
CentralWorld (Thai: เซ็นทรัลเวิลด์) is a shopping plaza and complex in Bangkok, Thailand. It is the second largest shopping complex in Southeast Asia, after SM City North EDSA of the Philippines. It's a landmark of downtown Bangkok and one of the favorite shopping mall of Bangkokians. Originally called the World Trade Center, the eight-story mall was opened in 1990. Central Group acquired the property in 2002 from the Wang Petchaboon group and soon thereafter renamed it Central World Plaza, and in 2005 rechristened it CentralWorld. With a range of offerings that encompass more than 500 stores, 100 restaurants and cafes, 15 cinemas, Kids' Zone and Learning Centre (Genius Planet Zone), two anchor department stores, as well as a trendy food court, the largest supermarket in Asia and an outdoor square for large-scale events like Bangkok's official New Year countdown party, there certainly is something for everyone. To prevent shoppers from getting lost, and to help circulate people to all areas and prevent clustering, a clear traffic circulation system was devised that enhance vertical and horizontal movement around the six interconnected shopping zones, each offering a different ambiance and certain unique features. There are also more than 100 escalators, as well as see-through lifts. CentralWorld's retail layout is influenced by the shopping street concept, allowing shoppers to spec several storefronts at a glance, whilst its overall design has placed a lot of emphasis on natural light / daylight that filters through the many skylights and open wells. Spectacular sculptures by famous artists are used as decoration features, and a glass mobile consisting of 3,500 glass balls hanging in an open well has had the crowds in awe. CentralWorld is on the forefront of technological sophistication too. Two of Southeast Asia's largest LED screens, measuring 9 x 16 metres, overlook the outdoor CentralWorld Square and will be used to broadcast major events. Inside, giant LED screens are also used to broadcast activities from one zone to another. More than 250 interactive LCD monitors and directories have been installed throughout to provide an estimated 150,000 shoppers daily with information and shopping directories. And the 40 ATM machines scattered around are also the largest number in any commercial complex in Thailand. The indoor parking lot - the largest in Thailand - measures 287,000 square metres and can accommodate 7,000 vehicles. Already completed is the 45-storey CentralWorld Offices, one of the city's most modern skycrapers. The renovations included completing an unfinished office tower, on which work had been halted in 1999 with only 39 of the planned 63 floors completed. Construction was resumed in early 2003, expanding the tower to a 45-story, 204 meter, design, with the completed tower opening in 2005. Centara Grand is a chain hotel built on land leased from the Crown Properties Bureau. The flagship hotel, the Centara Grand at CentralWorld, was attached to both the CentralWorld mall and the Offices at CentralWorld. After almost one month of the Red Shirt occupation of the surrounding areas, the Thai military crackdown and the surrender of Red Shirt leaders, CentralWorld was one of the more than 30 Bangkok buildings that Red Shirt protesters set ablaze on May 19. 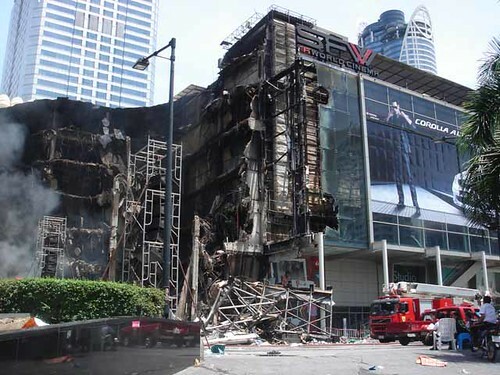 The fire got that ZEN, one of the 5 parts that made up CentralWorld, collapsed in the fire. Although CentralWorld has been severely damaged, it is still standing and can be restored. Central Pattana have said it would take at least 6 month to repair and rebuild the building. Visit CentralWorld and Thailand now on Landolia. When travelers dream of Thailand, they picture verdant jungles, sparkling temples and the exotic charm of its rural villages. Sangkhlaburi is home to all this. Located 225km northwest of Kanchanaburi and a mere 24km from the Burmese border at Three Pagodas Pass, Sangkhlaburi's seclusion only adds to its mystique. Sangkhlaburi is set towards the end of one of Thailand's most spectacular roads, nestled on the low hills edging Vajiralongkorn Lake (previously known as Khao Laem Lake), and is surrounded to the north and east by higher forest-covered limestone ranges. The outlying area hosts Karen and Mon villages, caves, waterfalls, the vast Thung Yai Naresuan wildlife reserve and Khao Laem National Park. Sangkhlaburi is a sleepy town of 15,000 people from many ethnic backgrounds. There are the Karen, the Mon, Thais, Chinese, Lao and even Arakanese and Bangladeshis. This ethnic diversity makes Sangkhlaburi district unique in Thailand. While Sangkhlaburi was traditionally a Karen town, a recent influx of Thais along with numerous Mon and Burmese settlers fleeing problems over the border, has created a culturally and religiously diverse town -- yet another reason to make sure you fit this lovely town into your itinerary. Historians believe the earliest visitors to the region were the Mons, who entered present-day Thailand sometime around the beginning of the Christian area and later established Dvaravati. Even today, warfare, political turbulence, and migrations continue to define the ethnic and social landscape of Sangkhlaburi region. Many of the Karens, Mons, and Burmese who have settled in the region over the centuries have become political refugees, unable to obtain Thai passport or permits for residence and work. Most remain stateless individual wanderers - shunned by both Thais and Burmese. However, Sangkhlaburi has a lot of natural attractions such as waterfalls, rough jungle and the Khao Lam Dam which flooded a valley of Sangkhlaburi and also parts of the old city. Sanglkhlaburi is also known for its 400m long wooden bridge that spans across the Vajiralongkorn Lake to connect the Mon village "Wang Kha" with the Thai and Karen parts of the town. This bridge was constructed in 1993 and has even attracted Thai and foreign movie teams! Despite its hundreds of years old history, today's Sangkhlaburi is a new town. When The hydroelectric Vajiralongkorn Dam neared its completion in 1984, old Sangkhlaburi had been demolished and the new town was created on higher grounds. All that remains of the past are the half-submerged structures of the old Mon-Temple and the basements of several buildings. And, the eroded remains of a 400 year old pagoda close to the impressive new Mon temple Wat Wang Wiwekaram which was fouded by the late Abbot Luang Pho Utama. Wangka (also known as Monside) on the other side of the Bridge is well worth visiting. Watch out for the street dogs (pick up a stone and it should scare them off). The village was founded by Luang Phor Uttama in 1949 after he fled Burma with 60 other Mon Families. Uttama passed away in 2006 and since then, the village has been in mourning. ==Alcohol is not permitted to be drunk in public== and doing so would be hugely disrespectful. This only applies to the Wangka, not Sangkhla. Many of the villagers speak Mon as their first language, so don't be surprised if they cannot understand your Thai. If you eat at a Mon restaurant, an easy word to remember is "Dangoon" for "thankyou". Sangkhlaburi is an idyllic place and well worth visiting as it is off the tourist trail and thus great for the tourist who wants to see "real thailand". The place is well known to Thais who come here for relaxing weekends away, or alternatively parties on the floating houses. But violence is not unknown here and the market area in the centre of town is probably best not explored after it closes. There can also be clashes between Mon and Thai youth on the bridge area. - Wat Wang Wiwekaram and Chedi Buddhakhaya: Walk over the bridge to the Mon village, and bear left parallel to the lake. After 2km the concrete road forks. Left goes to the huge golden chedi, with a small Burmese goods market below it, and right goes to the main Wat Wang Wiwekaram. The Wat was built by the late Phara Uttama, who was one of the most important Monks in Thailand, and is still highly revered in the Mon community. There is a large, ornate viharn at the main wat, and in another building there are murals depicting stages of the Buddha's last, and previous, lives. You may wish to hire a taxi as, for some, it might be a long walk to the temple, and it is easy to get lost in Wangka village (although people are happy to point you in the right direction). Visit Sangkhlaburi and Thailand now on Landolia. Located 28 km northeast of Bangkok city center, near Bangkok former Airport of Don Mueang, in Pathum Thani Province, the Dhammakaya temple was founded 20 years ago to offer instruction in Thamathayard meditation. The central bot is a marvel of modern Thai architecture which, unlike that of most Siamese temples, is characterized by pure, simple lines rather than highly ornate decoration. The theme of simplicity continues in the interior, where a black marble floor and plain white walls accent the presiding Buddha image illuminated with a single spotlight. Dhammakaya temple honors the legendary meditation techniques of a Bangkok monk named Pra Mongkol Thepmooni. As taught by the monk from Wat Paknam, meditation involves initial concentration on an imaginary crystal ball, then transferring that focal point to the center of the student's mind. There, the sphere expands to incorporate the universe and ultimately induces Dhammakaya, the visible Buddha. Located opposite to the main entrance of Dhammakaya temple, the dome-shaped shrine was built on a circular form of construction, resembling the sphere that spreads the dhamma teachings of Lord Buddha. The Great Memorial Hall of Phramongkolthepmuni was built in 2002, funded by donations from disciples of the late Ven. Phramongkolthepmuni, in honour of the highly revered monk whose rediscovery of the Dhammakaya tradition of meditation in 1914 had greatly revived the public interest in meditation and Buddhism. Also known as Luang Pu Wat Paknam (the abbot of the Paknam Temple), the Most Venerable had dedicated himself to the study, practice and teaching of meditation. His famous concept that stillness of the mind is the key to material and spiritual success has helped many to discover the purpose of life and to experience inner peace and self-sustaining happiness. Visit Dhammakaya temple and Thailand now, on Landolia. Ayutthaya (full name Phra Nakhon Si Ayutthaya, Thai: พระนครศรีอยุธยา, IPA: [aˡjutʰajaː]; also spelled "Ayudhya") city is the capital of Ayutthaya province in Thailand. The city was founded in 1350 by King U-Thong, who came here to escape a smallpox outbreak in Lop Buri, and proclaimed it the capital of his kingdom, often referred to as the Ayutthaya kingdom or Siam. Ayutthaya was named after the city of Ayodhya in India, the birthplace of Rama in the Ramayana (Thai, Ramakien). In 1767 the city was destroyed by the Burmese army, and the ruins of the old city now form the Ayutthaya historical park, which is recognized internationally as a UNESCO World Heritage Site. The city was refounded a few kilometers to the east. Ayutthaya is located 76 km north of Bangkok. It was one of Indo-China's most prosperous cities and is one of Thailand's major historical attractions. The grandeur of Ayutthaya is reflected by numerous magnificent structures and ruins concentrated in and around the city island surrounded by the Chao Phraya, Pa Sak and Lop Buri Rivers. Ayutthaya covers an area of 2,556 square kilometres. Visit Ayutthaya and Thailand now, on Landolia. Hua Hin (Thai หัวหิน) is a famous beach resort town in Thailand, in the northern part of the Malay Peninsula, some 230 km south of Bangkok. It has a population of 84,883 in an area of 911 km², and is one of eight districts (Amphoe) of the Prachuap Khiri Khan province. Hua Hin continued to develop in its own leisurely way, both as a aristocratic resort with the added attraction of an 18-hole golf course, and as a fishing port. The Railway Hotel, today's Sofitel Central Hua Hin, was built by the State Railways of Thailand in 1923 in the architectural style of old Siam. Many of Bangkok's rich and famous built their own beachfront summer homes to the north and south along the curving sandy bay, enjoying leisurely family weekends in a resort which has maintained its unique identity. Visit Hua Hin, Cha-Am and Thailand, now on Landolia! "Jingle bells, jingle bells, jingle all the way" – if the year's end has a theme song in Bangkok, this is it. In scores of malls, hypermarkets and department stores throughout the Thai capital, the Christmas season brings playlists of jolly songs, forests of twinkling trees and mountains of tinsel. The central shopping district around Siam Square and the renovated Central World Plaza mesmerizes with lights. As Buddhist people, not so many Thais know what Christmas is traditionally for, but they adore the colorful trappings of the holiday season. Santa Claus – virtually unknown a generation ago – is now a favorite Thai character, with staff in stores, restaurants and clubs, especially the girls, wearing Santa hats and costumes with extra smiles on their faces. For the substantial number of expatriates and tourists, dozens of hotels and pubs lay on gargantuan Christmas dinners, and the Christian community adds spiritual echoes with special events such as Handel's Messiah. After King Rama I's ascension to the throne in 1782 the palace was built. Prior to this, the royal palace and the centre of administration had been located in Thonburi, on the west side of the Chao Phraya River. For various reasons, the new king considered the former capital to be unsuitable and decided to establish a new capital on the other side of the river. By his royal command, a new palace was built to serve not only as his residence but also as the site of some administrative offices. The royal compound has been known since then as the Grand Palace. The two earliest structures erected within the complex were the Dusit Maha Prasat Throne Hall and the Phra Maha Monthian. Located approximately 862 kms south of Bangkok, Phuket (ภูเก็ต - formerly known as Tha-Laang or Talang), Thailand's largest island, located in the Andaman Sea off southern Thailand, is often dubbed as "The Pearl of the Andaman", or "The Pearl of the South". Phuket is divided into three administrative counties: Amphoe Mueang Phuket (เมืองภูเก็ต), Amphoe Kathu (กะทู้) and Amphoe Thalang (ถลาง). The main towns are: the capital Phuket (เทศบาลนครภูเก็ต), Pa Tong (the main touristical town with Patong Beach (หาดป่าตอง)), Karon, Kathu, Thep Krasattri and Choeng Thale. It's natural resources - rocky peninsular, limestone cliffs, white powdery beaches, tranquil broad bays and tropical in-land forests (Khao Phra Thaeo Non-hunting Area with its three highest peaks : Khao Prathiu (384 m), Khao Bang Pae (388 m) and Khao Phara (422 m) covers more than 20 km² of rainforest) contribute to making it the South's wealthiest, busiest, most visited and most popular island and province. Nestled in the tropical zone off the west coast of the southern part of Thailand in the Andaman Sea (ทะเลอันดามัน) - southeast of the Bay of Bengal, south of Myanmar, west of Thailand and east of the Andaman Islands - and the Indian Ocean (มหาสมุทรอินเดีย), Phuket province covers an area of approximately 543 sq kms (excluding small islets). It is estimated that Phuket Province covers an area of approximately 590 sq kms if its 39 other small islands are included. The islands total lengh, from north to south, is estimated at 48.7 kms and appoximately 21.3 kms wide. Phuket is connected to Phang-nga (พังงา) by Sarasin Bridge and Thep Krasattri Bridge. It's main beaches are Patong Beach, Karon Beach, Kata Beach, Kata Noi Beach, Nai Harn Beach and Bang Tao Beach. Staying on the island is easy, as there are only two seasons in a year: the rainy season (May to October) and the hot season (November to April). The low season is between September and October, also the wettest months. It is best to visit from November to February, when it's possible to see the clear blue sky, feel the fresh sea breeze, and marvel at the crystal clear water while lying on powdery, palm-fringed beaches. Average temperatures ranges between 23°C and 33°C. Phuket's topology is exceptional with 70% of its area covered with mountains which stretch from north to south. The mountains of Phuket form the southern end of the Phuket mountain range (เทือกเขาภูเก็ต), which ranges for 440 km from the Kra Isthmus (คอคอดกระ). The highest elevation of the island is Mai Thao Sip Song (Twelve Canes), at 529 m above sea level. The remaining 30% being plains located in the central and eastern parts of the island. The island does not have any major rivers except for a total of nine brooks and creeks. Near the southernmost point is Laem Promthep (Brahma's Cape), which is a popular sunset viewing point. Chiang Mai (เชียงใหม่), "Rose of the North", sometimes written Chiangmai or Chiengmai, capital of Chiang Mai Province (จังหวัดเชียงใหม่), was founded in 1296 and is Thailand's second-largest city after Bangkok (Krung Thep Maha Nakhon - กรุงเทพมหานคร) and the gateway to the country's north. Chiang Mai is the old capital city of Lan Na Kingdom. It is Located on a plain surrounded by mountains and lush countryside, with a cosmopolitan air and a significant expat population. The city, about 700 km north of Bangkok, stands on the Ping River, originates in the Chiang Dao Mountains, a major tributary of the Chao Phraya River (แม่น้ำเจ้าพระยา). 13.4% of the population on the Chiang Mai province are members of the hill tribes, among them the Hmong whose homeland is in the mountainous regions of southern China, Yao people (Chinese: 瑶族), Lahu (Chinese: 拉祜族), ethnic group of Southeast Asia, Lisu (Chinese: 傈僳族), Akha, ethnic group which originated in China and Tibet, and Karen (or Kariang, Thai: กะเหรี่ยง). Chiang Mai's historical centre is the walled city. The city used to be surrounded by a large wall. Sections of the wall remain at the gates (the most famous is Thapae Gate or Tapae Gate in the East and Chiang Puak Gate in the North) and corners, but of the rest only the moat remains. Surprisingly cheap, modern, friendly, internationally-flavoured and somewhat cooler than the south, Chiang Mai is surrounded by mountainous terrain and offers plenty of sight seeing activities, tours and great shopping (Chiang Mai's night bazaar, Central Airport Plaza, Central Kad Suan Keaw...) to complement the hospitality of its many hotels, guest houses and restaurants. Wat Phrathat Doi Suthep (ดอยสุเทพ), established in 1383 and perched on a hilltop overlooking the city; Wat Phra Singh with its Sinhalese Buddha, and located in the centre of the city; Wat Chiang Man, the oldest temple in Chiang Mai; Wat Chedi Luang (temple of the big stupa - วัดเจดีย์หลวง), founded in 1401 and dominated by the large Lanna style chedi that was unfortunately destroyed in the great earthquake of 1545; Wat Jet Yod and Wat Suan Dawk, a little out of town, are both over 500 years old; Wiang Kum Kam (เวียงกุมกาม) the site of an old city situated on the southern outskirts of Chiang Mai; Wat U-Mong, an ancient temple in the forest just outside Chiang Mai in the foothills in the west of the city, near Chiang Mai University (มหาวิทยาลัยเชียงใหม); Wat Suan Dok, a 14th century temple built by the King of Lanna, located just west of the old city-wall. Other outdoor activities include Chiang Dao (เชียงดาว), an hour north of the city; Chiang Rai (เชียงราย), 200 km northeast, and a transit point on the way to the Golden Triangle (สามเหลี่ยมทองคำ) and Myanmar (ประเทศพม่า); Lampang (นครลำปาง), 100km southeast of Chiang Mai; Lamphun, 26km southeast of Chiang Mai; Mae Hong Son (แม่ฮ่องสอน), a picturesque little town north west Thailand along the banks of the river Pai (แม่น้ำปาย), with lush valleys, rocky streams and a lake; Pai (ปาย), on the northern route to Mae Hong Son. The Doi Inthanon (ดอยอินทนนท์), the highest mountain in Thailand, 60km southwest of Chiang Mai. Thank you for submitting so many pictures of Thailand. More pictures will be added later. Thank you for all your submissions.